Save hours of research and find sources and discussion of jury instructions. Looseleaf, one volume. Revised 2016. Full description below. 1 copy: $95; 2 copies: $175; 3 copies: $260; 4 copies: $345; 5 copies: $425. One volume, looseleaf, published 2010. Supplement 2 (December, 2016) is now available. Total replacement contents. 198 pages. This title includes online and print sources of federal, state and topical jury instructions. Guidelines and practice tips for drafting jury instructions are also included. This is a practical go-to title for librarians, lawyers, and all legal researchers. Compiler: Elyse Fox, BA, JD, MSLS. Ms. Fox has worked as a law librarian for 30+ years. She previously practiced law in Chicago and Boston. 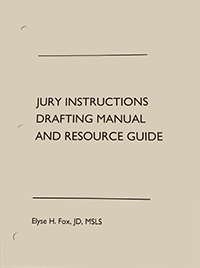 Jury Instructions Drafting Manual and Resource Guide is an essential title for attorneys, law students, law librarians and paralegals. “… Even with so many items available at no cost on the Internet, Elyse Fox’s manual remains a useful addition for most law libraries. The drafting guidelines and directions to previously-prepared jury instructions alone make this valuable. The collected bibliography is another reason for using this manual. The manual may be particularly useful for law libraries that already have a good collection of the previously-published jury instructions.” Legal Information Alert 2011. “… This valuable reference guide provides users with an explanation of the various kinds of jury instructions, both pattern and non-pattern; guidelines for drafting jury instructions; a bibliography of jury instructions for the federal circuits and states; and federal and state topical jury instructions. It also includes a list of selected jury instruction organizations and conferences, and concludes with a selective bibliography, webliography and resource guide to articles on the subject of jury instructions … This is an essential addition to any legal research collection.” Kendall Svengalis, Legal Information Buyer’s Guide and Reference Manual.